All transactions are safe and secure with a reliable history in online purchasing behind each of our associates. Buy the Jesse and the Rippers t-shirt to own Full House clothing and merchandise. 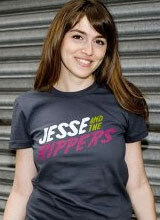 This Jesse and the Rippers shirt is for fans of Uncle Jesse's musical talents. The band's song "Forever", was sung by Jesse on his wedding day to Rebecca and again when they made a music video for it. The song was originally written and recorded by The Beach Boys, who were in the video as well. As a friend of the band in real life, John Stamos was able to have them make cameos on a couple episodes throughout the series. Get jamming in your Jesse and the Rippers Full House shirts now. In addition to the Jesse and the Rippers tee above, browse the Full House Clothing Gallery for more apparel like men's and women's clothes, kids shirts or hoodies.